The dangers of Deep Packet Inspection coupled with sponsored advertising keywords, e.g. the notorious Phorm, or just the dangers of sponsored search engine keywords coupled with the exisiting and future Communications Traffic Data retention and snooping databases, is illustrated by the inept Metropolitan Police Service Google AdWord / sponsored link campaign, currently afflicting www.google.co.uk. 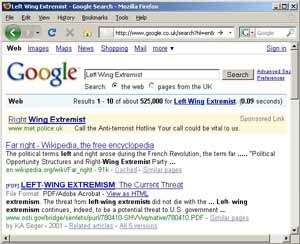 If you search for the following phrases, you will get a Sponsored Link to a Metropolitan Police Service's Specialist Operations web page, which re-hashes their controversial "suspect everyone who travels or uses any modern technology", advertising campaign, promoting the supposedly confidential anti-terrorism hotline. If your blog or website is running Google adverts and is unlucky enough to have such beeing automatically, and very fallibly classified as such, these sponsored advert banners may also appear on or around your web content. However, although these "right wing" bloggers seem to be the first to notice this, it does not necessarily mean that only they are on some carefully chosen NuLabour political watchlist. www.met.police.uk Call the Anti-terrorist Hotline Your call could be vital to us. These search engine query keywords are not being applied fairly or impartially or even logically. No doubt there are other possible combinations and variations, and the results may vary depending on which of the multiple Google search engine boxes you are actually being served by at any particular time. Google are probably desperately trying to fix this, and some or all of the above may not not work, but the fact that these inaccurate results came up at all (we have screen capture evidence)) indicates just how politically dangerous this technique is. As advertising sponsors, the Metropolitan Police Service are entitled to some of Google UK's search engine log file data. Under the current, and soon to be expanded Communications Traffic Data laws, the MPS can demand and snoop on even more web server logfile and ISP IP address record logfile data. Home Secretary Jacqui Smith's weasel worded assurances that the existing European Union Communications Data Retention Directive, and her forthcoming Communications Data Bill, would not grant direct access to the "content" of a web page (i.e. 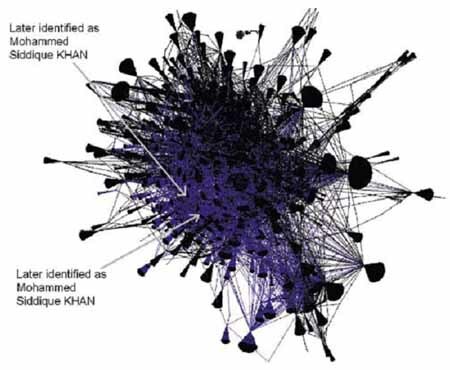 interception of electronic communications, requiring a targeted warrant signed by the Home Secretary), it is clear that the state authorities would have access to a logfiles of the Results pages returned by these Google keyword searches. 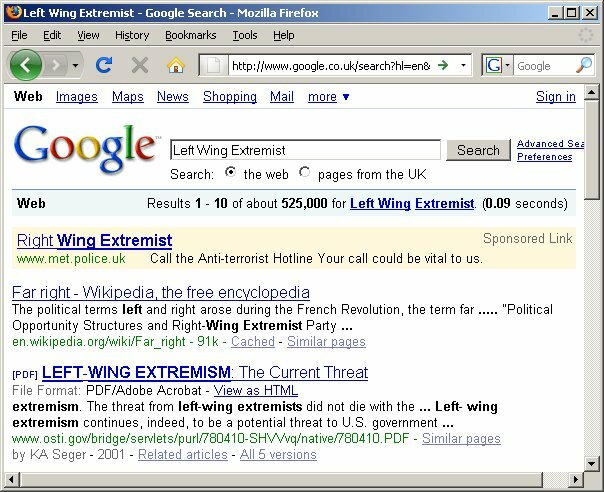 Most public web search engines, including Google, tend to encode the actiual keyword search terms in the URL of the web page via the HTTP GET method, so there is no real world distinction between "communications data" and "content of communications" with respect to web search engine queries..
Continue reading Google.co.uk - politically insensitive and inaccurate Metropolitan Police Service "Extremist" Sponsored Links and AdWords campaign.